We will show you how to set up and run your own independent vending services to businesses in your own area, and advise you how and when to expand and what equipment you’ll need for individual sites to obtain the highest returns from these sites. When you consider the return on investment on other products such as Bank fixed deposit (6%) and the Stock Market (± 20%), The Return On Investment of ± 40% per annum can be achieved on cash purchase of a machine is highly favourable. >> Should finance be required, we can liaise with any finance company of your choice. To provide a complete solution to run your own highly profitable business from a small capital outlay, by eliminating unnecessary costs like franchise fees, area licenses, etc. You will be providing a unique vending service to companies, offices and factories in your area by supplying low cost, quality vending machines stocked with brand name snack products such as Nestlé, Coca-Cola, Simba and Cadbury. Even once your business is running, we will provide on-going help and advice without imposing restrictions, leaving you free to expand and develop at your own pace. Will be factories, offices, hospitals, schools or any working environment that will benefit from having a snack/can vending machine on their premises. Many businesses value the opportunity to have snack vending machines on their premises as this often reduces the amount of absenteeism whilst employees wander to the snack shop or canteen during working hours. This yields more productivity to the company and is often described as an “invisible” asset. Few businesses of suitable size object to vending machines being sited on their premises. It’s your business take charge and responsibility from day one. As a small business owner you must be the principal strategist and planner. To understand the new business, as well as the necessary resources and strategies, it makes sense to start with a business plan . Expect to revisit you plan and strategy and adapt it as needed. As the owner, your duties are as diverse as collecting your revenue, creating a stock sheets, setting up a filing system, marketing and minor technical repair. You might be very good at what you do to make a product or provide a service, but running a small business brings a whole range of other responsibilities. Is to offer and provide a snack or drinks vending service on a company’s premises in and around your area (it should be noted that we do not have any restrictions on where you operate the machines, but it does make practical business sense to have machines sited within easy travelling distance). You will be required to stock and cash these machines on a regular basis. All proceeds from the takings of these machines are yours. THE MORE SITES YOU OPERATE, THE MORE PROFIT YOU WILL MAKE! Is solely to supply you with the equipment, at trade prices, and give you all the advice necessary to operate your business successfully. 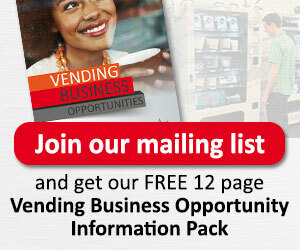 Vending Solutions only profit from the sale of its machines. It is in our interests to give you all the advice and knowledge to help your business succeed, as your success contributes to our success. We will even find sites for you, so all you have to do is install the machine, keep it stocked and collect the cash. Should a machine not perform adequately within three months of being sited Vending Solutions will assist you with finding a secondary site. You will however have to pay for the movement of the machine which can be carried out by our trained technicians. For some people the idea of picking up the phone, arranging appointments with prospective customers and selling the idea may be daunting. As briefly explained in the previous paragraph, we can find your customers for you so all you have to do is maintain the sites. It is surprising how quickly your business can grow with this approach. Whilst we endeavour to provide you the best possible locations for your business, we cannot in any way guarantee the success of the location. Once your sites are up and running, you will be required to keep them stocked with products on a regular basis. At the same time you will cash the machine (all takings are yours). The machines are designed to be easily accessible, and Vending Solutions provides full training on the operating of your machines and advice on how to deal with your sites. On average, one machine makes a profit of around R 2000 to R 4000 per month that is a profit of + – R 48000 per year, per machine. You could comfortably maintain around 12 machines a month generating a gross profit of R 576 000 year. We already have customers making good profits and purchasing machines from us on a regular basis. Please note that this is still a part time business. Bear in mind that these figures are only an indication of potential financial viability and may not be achieved. Your management style and overall commitment are crucial to success. The information contained in this business opportunity has been compiled solely for information purposes to assist in making your own evaluation of the business opportunity. It does not purport to contain all of the information you may require. You should conduct your own investigation and analysis of the business opportunity, market, data and information contained herein and seek professional legal advice. None of Vending Solutions, it's subsidiaries and or associated companies, employees, officers or agents makes or gives any representation, guarantee or warranty as to the accuracy or completeness of the information contained in this business opportunity and none of such persons will have any liability whatsoever for any direct indirect or consequential injury, loss or damage that you or any other person may suffer arising from any information or matters contained in or derived from, or for any omissions from, or failure to correct any information in, this business opportunity or any written or oral communications to you in relation to the business opportunity. Whilst every effort has been made to ensure that the information provided in this business opportunity is free from error or omission Vending Solutions assumes no responsibility for the interpretation of the subject matter herein. The information contained in this business opportunity is not a substitute or intended as a source of legal or accounting advice. The information contained herein may be subject to varying Federal, State and/or Local government regulations. We advise the retention of competent counsel in determining what if any regulations apply to various individual businesses. Vending Solutions assumes no responsibility or liability whatsoever on behalf of the reader or purchaser for this material and information. We do not guarantee any results you may or may not get by following recommendations contained herein.